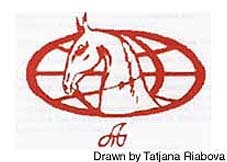 MAAK is the International Association for Akhal Teke Horse Breeding (registered in Moscow) which was established on the 5th of April 1995. Mr. Suparmandov Nyazov is also the President of Turkmenistan. "Our excellent studs are glorified throughout the world by their beauty and speed. Those are the horses that have been bred and perfected in ages by our ancestors with love and mastery, thus creating one of the most wonderful masterpieces of the Turkmenistan people."  Vice-President of MAAK is Tatjana Riabova works in Rayzan in Russia, which is the Russian town for registering all horse breeds and organising the Stud Books and Registration of horses in Russia.  The second Vice-President is Geldi Kyarizov, he is an Akhal Teke breeder in Turkmenistan, he assists President Nyazov and runs the Hippodrome. To unite professionals and all people who appreciate the Akhal Teke in its purebred and crossbred form and to take part in the preservation and improvement of this ancient horse breed. 1. The protection, preservation and improvement of the pure bred Akhal Teke horse. To maintain the breed's purity, its specific type, its performance quality. 2. The keeping of two Stud books, one for purebreds and one for Akhal Teke crossbreds. 3. The control of a truthful breeding record and the selection work. 4. Consultation concerning all questions of breeding and keeping of Akhal Tekes. 5. Support in making the breed more popular and to spread information concerning the breeding of Akhal Teke horses. 6. Increase the ability of the Akhal Teke horse breed, to stand their ground among other breeds used in sports and to help the Akhal Tekes spread in the horse world. 7. To develop international context and cooperation among the countries of the former Soviet Union, Foreign Organisations, with companies or private people in the field of breeding and keeping of Akhal Tekes. 8. Taking part in congresses, meetings and other events in the course of the activities of the association. 1. Keeping breeding records of the breed, control and correct selection, registration and testing of the offspring and licensing the main breeding stock. 2. Issuing of breeding documents (pedigrees, certificates, licenses). The MAAK centre of Breeding and Selection is the only organisation, which has the right to issue breeding documents. 3. To keep a general studbook for purebred Akhal Tekes, and register half bred Akhal Teke horses and Akhal Teke crosses. 4. Every year to prepare and publish the Stallion Catalogue, The Register of Young Horses and a reference book on the breed, with characteristics of all groups of animals, analysis of their performance abilities and a grading of sires according to the quality of their offspring. 5. An Akhal Teke is only considered purebred if it has documents issued by The Rayzan Institute, signed either by Tatjana Riabova or Nadya Abramova.